Ramp up your listening experience from inside your car with the Pioneer DEH-X16UB In-Dash CD Receiver. This product boasts Android media access so you can listen to your favorite tracks via your phone. 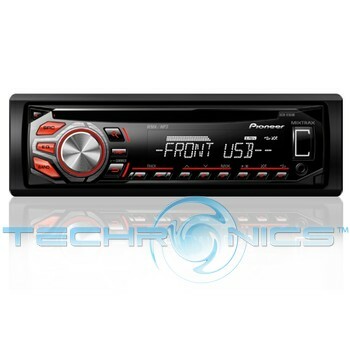 It can play a variety of media, including MP3s, WMA files, CDs, CD-Rs, CD-RWs and more with the included AUX and USB ports. The stylish looking Pioneer in-dash receiver can accommodate one disc at a time. Constructed with a detachable LCD display face, it comes with a remote control, wiring harness, a DIN mounting cage, plus instructions and a detailed owner's manual. If you want to play only a select list of songs, you can program the unit with 18 FM and six AM radio stations.